DeWalt has just announced the launch of their new 3-beam line-laser (DW089K), and oh how I love to use lasers at work. They make leveling so easy that it is funny to even think about going back to using regular levels to mark long level lines across walls. I think the line-laser is one of the most invaluable tools on the jobsite, at least in my trade. The DW089K is not unlike other line-lasers on the market today, but it does have a rather handy added feature, a third laser line. This extra vertical line gives the user the ability to use the laser as a large square. It essentially takes the features of a laser-square, makes them better, and adds them to a line-laser. Now not only can the laser project square lines onto a vertical surface, but now it can do it on horizontal surfaces as well. Notice how tough the DW089K looks? It looks like it can take more abuse than other lasers on the market today. The DW089K is the only line-laser that I know of that features a built-in roll cage. We always want to be careful with precision instruments line lasers, but accidents do happen, so a roll cage to protect the glass and the lasers behind them is nice. DeWalt's DW089K also gets a performance boost, according to DW, the lasers are 2x brighter the DeWalt's previous line-laser models. The new line-laser also features a micro adjust knob that should help with squaring, this adjustment knob allows users to more easily position the laser in finer increments. 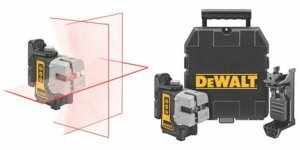 The DW089K includes the laser, a universal mount that can be used for everything from hanging drop-ceiling track to cabinet installs, four AA batteries that provide a minimum of 30 hours of run time, and a storage case. The DW089K is expected to hit stores this September, and is expected to retail for $329.